The reason why was because with only a few laps to go in the main event, fellow Honda rider Trey Canard had ridden a fantastic race to catch Barcia and make the pass up the inside of the whoops. The next left hand turn saw Canard go in first and he looked to have the made pass when Barcia checked up a bit, moved to the inside of Canard and basically the teammates met at the exit of the corner with some serious contact. And Barcia was the winner of the contact as he stayed up and Canard shot outside and weebled-wobbled a bit. That was all Barcia needed to take the win for the second night in a row and with Honda team manager Dan Betley watching carefully, things were indeed tense in the pit with Barcia and Canard only separated by five feet or so. Andrew Short (right) would round out the podium. “I thought it was a good ride and I felt strong, I made some mistakes and still closed in and made a pass. I could have sealed the deal but some room was made in that turn. I need to learn from that hopefully I can seal the deal tomorrow,” said Canard after the race with his usual class. One could tell he was taking the high road on this one. Barcia for his part was happy for the win but not real happy with how he rode. “I made an aggressive move, I saw him go by and checked up,” he explained. “I was a bit slower tonight and he rode well, too. I got lucky to win tonight with my aggressive move and I have to be better. Both last night and tonight, the Honda riders have been the best of the field and going into tomorrow afternoon’s final Barcia has a 1-1 to Canard’s 2-2 so Trey needs some help to pull off the King of Bercy title even if he were to win the final main event. Canard can take solace in the fact that he did win all three of the elimination races over Barcia which gave him the all-important inside gate pick for the main event. The two inside gates are the obvious ones to be in, but Barcia made his way past Canard in the first turn in the main event. He’s been one of the only ones to get a holeshot while not using the inside gate. The Super Pole was won by French hero Gauthier Paulin although when he crossed the line he was initially slower than leader Barcia but then in a bit of French magic, the clock rolled back and the crowd got their hero up on top! Cooper Webb rebounded Saturday to take home fourth. But back to the main. While the two Honda riders were out front, BTOSports.com KTM’s Andrew Short ran a lonely third. 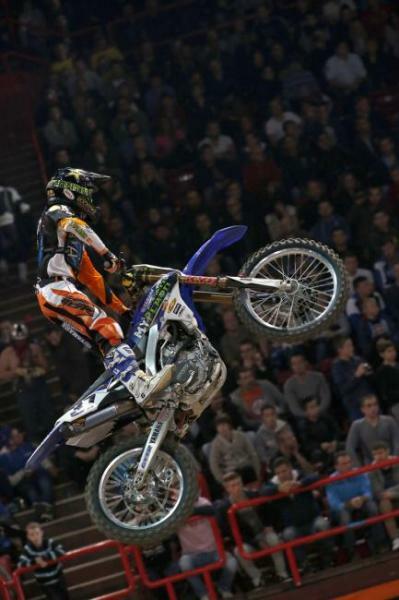 As a two-time King of Bercy, Short is certainly familiar with the tight confines of the arena. MyPlash Yamaha’s Cooper Webb is a Bercy rookie and it showed yesterday with some difficulty in qualifying and in the main event. Webb was much, much better tonight and finished an impressive fourth in the main event. But it wasn’t without drama as Webb and the crowd favorite Paulin (who last night finished third) dueled hard for nearly the entire main event. 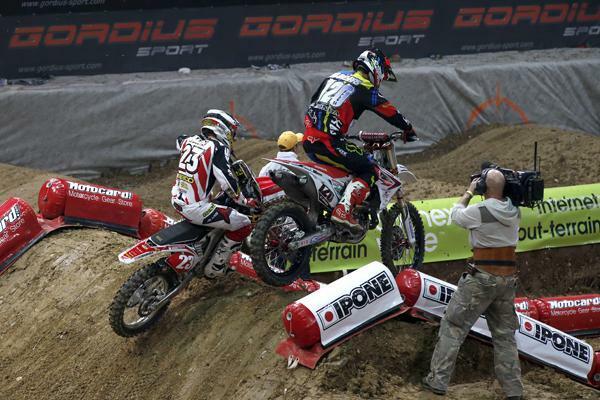 In the last turn they made contact before Webb managed to hold on for fourth over Paulin. It was intense all the way. Wil Hahn would finish sixith after a slow start. Webb mentioned the other American racer we didn’t talk about yet—Wil Hahn. He got a bad start and it took him a long time to work around Cedric Soubeyras. Once he did that Hahn started riding a lot better and closed in on the battle for fourth and fifth. 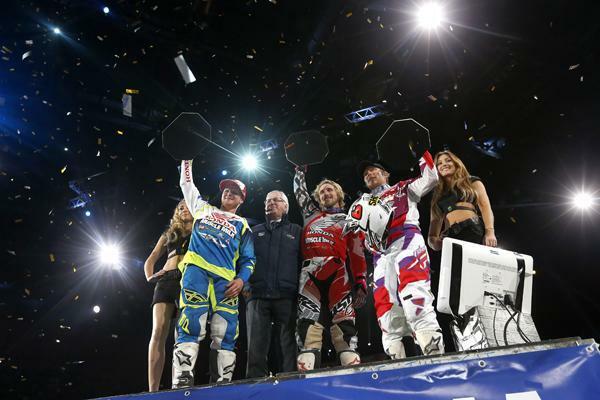 Stay tuned right here tomorrow to get the results from the final day of racing here at Bercy. Something tells me that the fireworks aren’t quite done here.